Grab or Freeze a Frame from a Video Image. 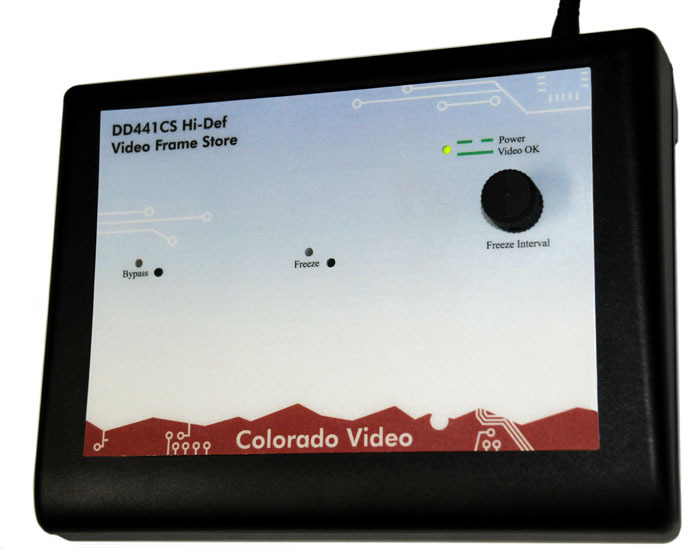 The Model 441C Series Video Frame Store, is a full frame, high resolution, video memory. This Video Frame Store is a stand-alone, independent, non-computer based frame grabber. In its "live" mode, the input signal will pass to the output. Toggling the 441 to its "freeze" mode causes it to freeze a frame of video from the input and provide it at its output continually, until it is given a command to toggle back to the live image. The freeze/live command can be given by a front-panel push-button or rear-panel pulsed contact closure input. The 441's functionality can be especially beneficial in the process of video inspection inspection, such as those requiring scruitiny of sewer lines and fiber optic cable. A bypass mode can also be activated to enable viewing the live picture without updating the stored image when bringing it back to view. A built-in timer allows automatic updating and viewing of the frame memory contents at intervals of full frame rate to once per ten seconds. Power input requirement is 5 VDC at at less than 1 Amp. A UL listed AC adapter is included.